The three youths who were arrested on Wednesday for saying the "Shema Yisrael" (Hear O Israel) prayer on the Temple Mount were released after spending several hours in the Old City police station. 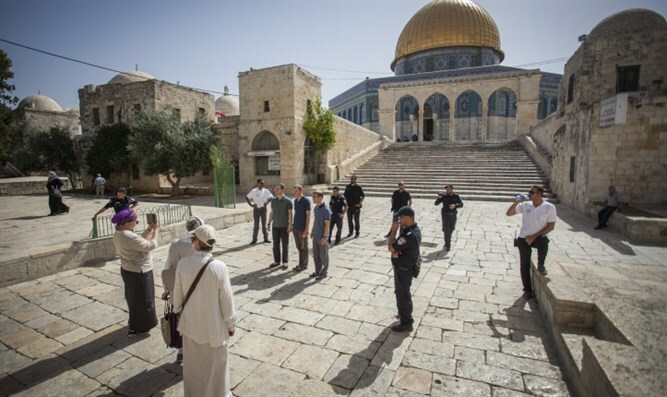 The youngsters were interrogated on suspicion of disturbing public order, and released with an order to attend an administrative hearing, during which police intend to order them not to ascend the Temple Mount. Honenu Attorney Nati Rom, who provided the youths with legal aid, slammed Israel Police for arresting them on "the eighth day of Hanukkah - the holiday when the Maccabees purified the Holy Temple." "Unfortunately, Israel Police arrests young boys, when their only crime was that they expressed their faith and prayed in a holy place. This type of arrest must never happen, especially since there is no law forbidding Jews from praying on the Temple Mount. "Israel Police is claiming the boys 'disturbed public order' when it is very clear that they did not disturb public order. Those who did are the police themselves. "The days when Jews were arrested for their faith are over. We are allowed to say 'Shema Yisrael' everywhere, and we will work to ensure that Jews can act according to their faith both in Europe and Israel. Unfortunately, Israel has a policy of where Jews can pray and where they cannot. This policy must end." Jews are only allowed to ascend the Temple Mount during certain hours, and the Temple Mount is closed to Jews every Friday and Saturday. Any act, or suspicion of prayer can lead to arrest.